If you're looking for a new SUV to take on 2018 with, you're probably considering the Jeep Grand Cherokee. An award-winning vehicle, the Grand Cherokee has standardized its 7-inch touchscreen and introduced a supercharged V8 engine in the Trackhawk model this year. A second contender in the SUV category is the Honda Pilot, which has made Apple CarPlay and Android Auto compatibility standard for its second-tier trim level and above. To understand what makes these vehicles unique, we have analyzed their power, handling, features, and design below. Jeep places a strong emphasis on engine power, which is reflected in the lineup for the Grand Cherokee this year. The standard Laredo trim comes equipped with a 3.6-liter V6 engine with 295 horsepower and 260 lb-ft of torque. The second tier Limited trim and above can be outfitted with a 5.7-liter V8 engine with 360 hp and 390 lb-ft. The SRT trim introduces a 6.4-liter V8 with 475 hp, 470 lb-ft. At the top of the trims is the Trackhawk, which receives a supercharged 6.2-liter V8 engine and 707 hp, 645 lb-ft. Depending on the engine the buyer selects, two- or four-wheel drive and an 8-speed automatic transmission can be paired with it. Another element to consider is the Grand Cherokee's towing capacity, which can haul up to 3500 pounds. Honda fails to compete in the engine category. With just one engine offering, The Pilot comes standard with a 3.5-liter V6 engine with 280 horsepower and 262 pound-feet of torque. This is paired with a six-speed automatic transmission. On the Touring and Elite trims, a nine-speed transmission may be chosen. Additionally, the Pilot comes with front-wheel drive. The Pilot offers a traction-management system with driver-selectable modes that enables the driver to manage wheel slip in normal, snow, mud, or sand conditions. Jeep offers seven different trim levels to choose from: the Laredo, Limited, Trailhawk, Overland, Summit, SRT, and Trackhawk. The Laredo comes with 17-inch wheels, heated mirrors, a rearview camera, rear parking sensors, keyless ignition and entry, dual-zone automatic climate control, Bluetooth, a 7-inch touchscreen, and a six-speaker sound system. The Trailhawk adds desirable off-road features such as hill ascent and descent control, an electronic limited-slip rear differential, underbody skid plates, and an upgraded instrument cluster display with exclusive off-road features. The Trailhawk also adds amenities in the form of power-folding mirrors, ventilated front seats, an 8.4-inch touchscreen interface, a navigation system, and Apple CarPlay and Android Auto smartphone integration. 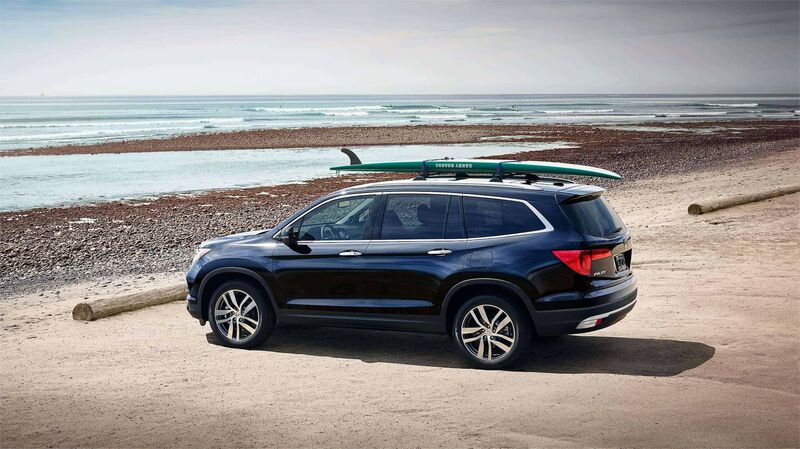 The Honda Pilot makes an excellent fit for family-oriented transportation. The standard trim comes with 18-inch alloy wheels, air-conditioning, cruise control, a tilt-and-telescoping steering wheel, a 5-inch central display screen, rearview camera, and Bluetooth phone and audio connectivity. The EX adds automatic headlights, foglights, remote engine start, and an 8-inch touchscreen interface. Honda has several great safety features, though some, like blind-spot monitors, only come on the more expensive Elite versions of the Pilot. Both the Jeep Grand Cherokee and Honda Pilot have made some great updates for 2018. We recommend choosing the Jeep Grand Cherokee for its superior engine power and vast array of trim options. Visit our dealership today to see which Grand Cherokee fits your needs best.